M&P can make custom PEEK Machined Parts to your specifications or drawings. We have a plastic machine shop; PEEK™ is one of the plastics we can use to make parts. PEEK™ is an abbreviation for polyetheretherketone, a high performance engineering thermoplastic. PEEK™ grades offer good chemical and water resistance and can operate at high temperatures. PEEK™ can be used continuously to 480°F (250°C) and in hot water or steam without permanent loss in physical properties. For use in hostile environments, PEEK™ is a high strength alternative. PEEK™ carries a V-0 flammability rating and exhibits very low smoke and toxic gas emission when exposed to flame. Unfilled PEEK™ is approved by the FDA for food contact applications. 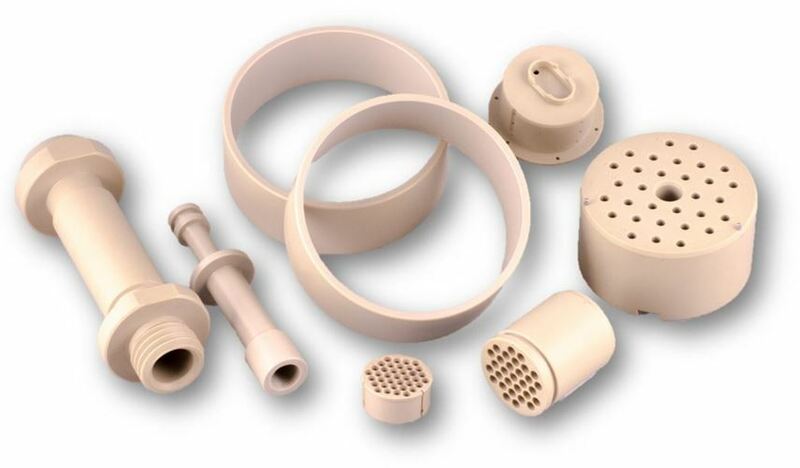 PEEK Machined Parts made from general purpose Unfilled PEEK™ is not reinforced and offers the highest elongation and toughness of all PEEK grades. PEEK™ material is available in the following colors: LIGHT BROWN (natural color) and BLACK. Black PEEK™ is ideal for instrument components where aesthetics are important, as well as for seal components where ductility and inertness are important. Unfilled PEEK™ grades comply with FDA regulation 21 CFR 177.2415 for repeated food contact. 30% glass filled PEEK™ parts have an increase in flexural modules and a reduction in expansion rate. Glass-filled PEEK™ is only available in a LIGHT BROWN color. 30% carbon filled PEEK™ parts have enhanced compression strength and stiffness and a dramatically lower expansion rate. It offers designers optimum wear resistance and load carrying capability in a PEEK™-based product. This grade provides 3½ times higher thermal conductivity than non reinforced PEEK™ — dissipating heat from the bearing surface faster. Carbon-filled PEEK™ is BLACK in color. Bearing grade PEEK™ parts, containing carbon fiber reinforced with graphite and PTFE lubricants, offers the lowest coefficient of friction and the is the easiest grade of PEEK™ to machine parts from. Bearing grade PEEK™ has an excellent combination of low friction, low wear, high limiting PV, low mating part wear, and easy machining. Bearing grade PEEK™ is BLACK or DARK GRAY in color. PEEK™ Machined Parts are made in a completely controlled environment. We also specialize in PEEK™ Back-up Rings. M&P keeps PEEK™ in stock so that we are ready for immediate production of your PEEK™ Machined Parts.